Jack Nicklaus used his wealth of knowledge and experience in the game to develop more than 300 courses which are truly in a league of their own. 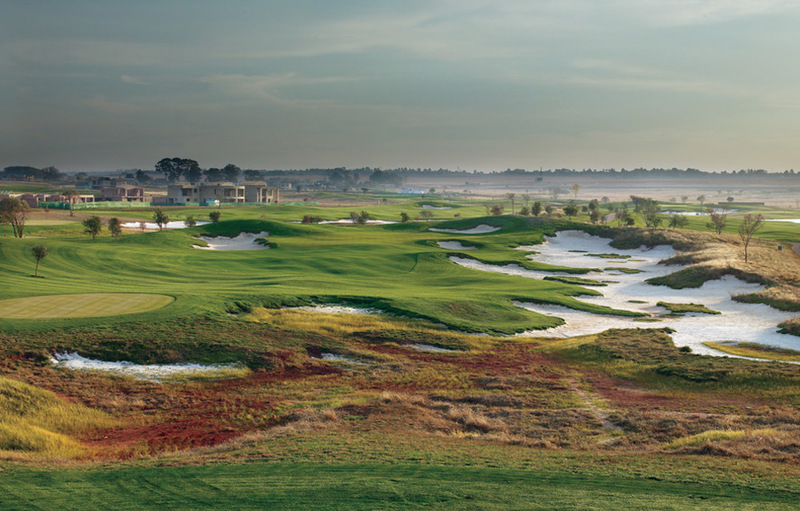 Challenging to the professionals and inspiring to amateurs, African Fairways invites you to test your mettle against six magnificent Jack Nicklaus designed golf courses. Upon arrival at Johannesburg International Airport, you will be met by a friendly African Fairways representative and assisted with a private transfer to The Saxon Hotel in the exclusive suburb of Sandhurst in Sandton. The hotel has been voted as the World’s Leading Boutique Hotel for the past six years. Accommodation is on a two nights’ bed and breakfast basis with dinner as an optional extra. 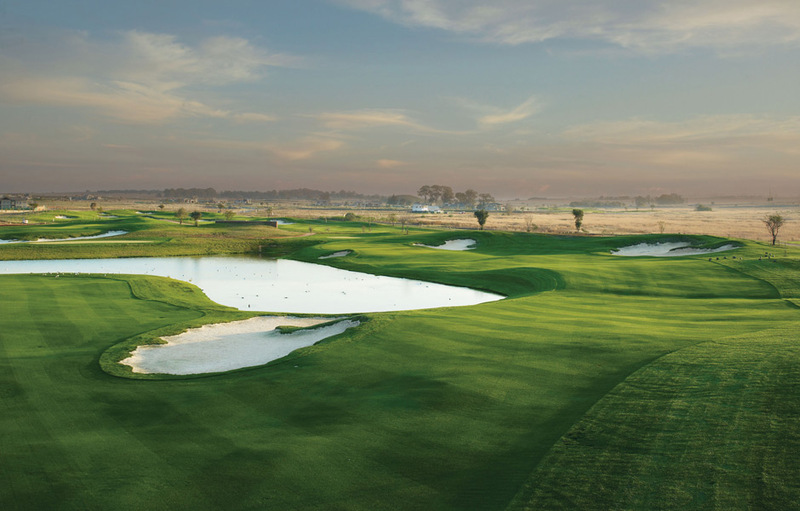 Today you start your Experience at Serengeti Golf Club, the home of the 2011 and 2012 South African Open Championship. 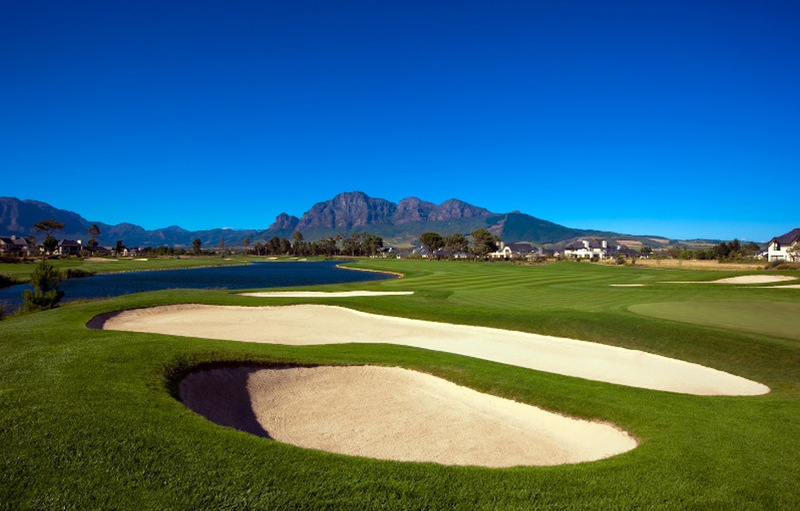 While the course is only three years old, it has already won a number of awards including a Five Star Service Award from Compleat Golfer, and Best New Golf Course in South Africa by Golf Digest. Optional: Soweto Tour and the Apartheid Museum - delve into the deep and intricate history of South Africa. Alternatively why not indulge in the spa at The Saxon. After an early morning start, you will be transferred to the scenic area of Magaliesberg, roughly 45 minutes from Johannesburg. Bring your A-game because the Golden Bear’s course at Pecanwood Country Club is outstanding, not just for its magnificent vistas, but for its smart design and layout. This course favours intelligent play over physical strength and has something to offer players at every level. Optional: Visit the DeWildt Cheetah Sanctuary and The Elephant Sanctuary. A 90 minute transfer takes you to Oliver Tambo International Airport where you will board a scheduled flight to Port Elizabeth. Upon arrival at Port Elizabeth, you will be assisted with a 90 minute road transfer to malaria-free Shamwari Game Reserve one of the most successful private conservation initiatives in Southern Africa. Here luxury accommodation is offered at either Long Lee Manor or Bushman’s Lodge on a fully inclusive basis. Revel in the majesty of the African Bushveld with early morning and late afternoon game drives where you will hopefully spot the Big 5. In between game drives, you may choose to spend your time relaxing, enjoying a spa treatment or visiting the Born Free Big Cat Sanctuary. A two hour private transfer will take you to the scenic St. Francis Bay where you may spend the afternoon at leisure. This coastal paradise draws holiday-makers from all over the world to enjoy the glorious beaches and warm Indian Ocean, the excellent water-sport facilities, golfing, and a leisurely lifestyle. Your accommodation for the night, (bed and breakfast basis,) is at the St Francis Links Golf Lodge overlooking the first tee of the exquisite St Francis Links Golf Course. For the non-golfers there are many activities to keep you occupied. Spend a day 4x4ing at Baviaanskloof or take the plunge off Storms River Bridge – the highest bungee jumping in the world. For those who prefer life’s gentler pursuits – a horse ride along the beach or a leisurely boat cruise down St Francis Bay‘s gentle waterways is the perfect way to spend your day. Today you’ll learn why St Francis Links Golf Course is a truly mystical destination. This exquisite and challenging courses emerges from the natural landscape in a series of undulating fairways, rugged bunkers and luscious greens, all born from the natural movement of the land. The course invokes the spirit of centuries-old courses in Scotland and Ireland. Currently ranked 9th in South Africa, this is a must play course for the golfer who reveres the history and tradition and embraces the challenges of the glorious game. In the afternoon you will be transferred to Knysna (3 hours). Your luxurious accommodation in Knysna will be at Pezula Resort Hotel and Spa. Overlooking the Indian Ocean, this beautiful, multi-award-winning Resort and Spa which opened its doors in 2005, offers families and friends an incomparable lifestyle destination. You will spend three nights here on a bed and breakfast basis with dinner as an optional extra. While not a Jack Nicklaus course, Pezula’s magnificent championship links golf course still comes highly recommended and is reminiscent of Gleneagles in the Scottish Highlands and Pebble Beach on the Monterey coastline. There is a cornucopia of activities for you to enjoy along the Garden Route. For the more sedate traveller there are a number of pampering luxury spas, birding and walks through the Tsitsikamma Forest, discovering the Cango Caves outside Oudtshoorn or saltwater fly fishing. For the more adventurous among you why not try abseiling, black-water tubing at Storms River, a motorcycle tour, paragliding, quad biking, rock climbing or shark cage diving. 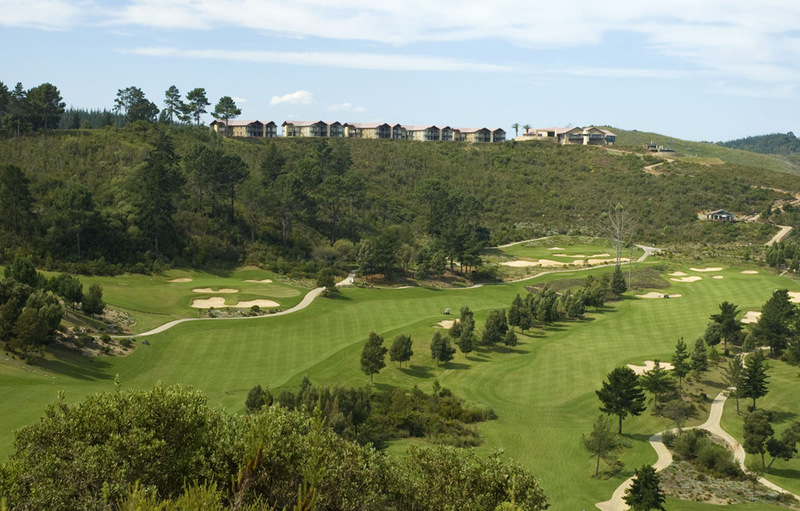 Today you will test your skills on Simola Golf Course’s unusual configuration of five par-fives and five par-three’s which add a new dimension to the game. 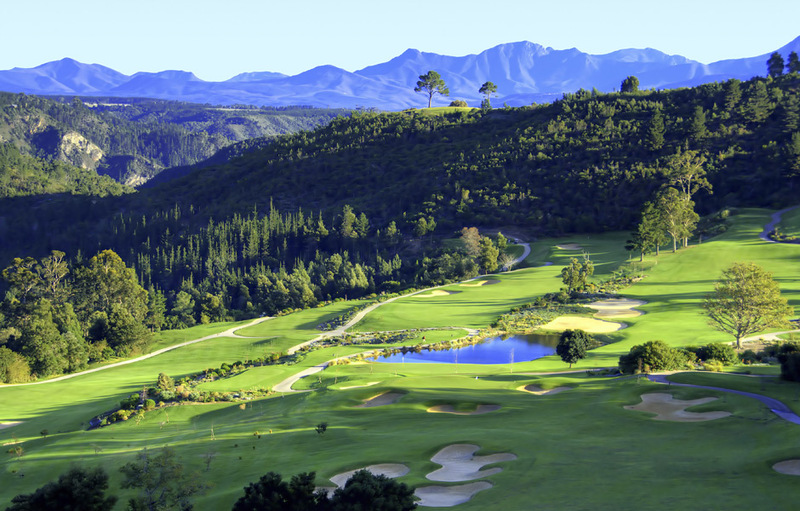 This course is spectacularly located, nestled in the lush indigenous landscape of the hillside above the scenic town of Knysna on South Africa’s Garden Route. Uninterrupted vistas allow visitors panoramic views of the Outeniqua Mountains in the distance and as far as the Knysna Lagoon and Knysna Heads as they jut out into the deep blue Indian Ocean. After testing your mettle, you’ve earned a break, take the rest of the afternoon off to relax and enjoy this gorgeous coastline. After breakfast and checking out, you will be transfer to George Airport (1 – 1.5 hour road transfer), where you will board your scheduled flight to Cape Town International Airport. On arrival in Cape Town you will be assisted with a private transfer of 30-45 minutes to the heart of the beautiful Winelands. Here you’ll spend two glorious nights, (on a bed and breakfast basis), at the grand Delaire Graff Lodge and Spa. The lodge is considered to be one of South Africa’s leading luxury destinations and the Estate has won numerous accolades for its accommodation, design, food and wine. 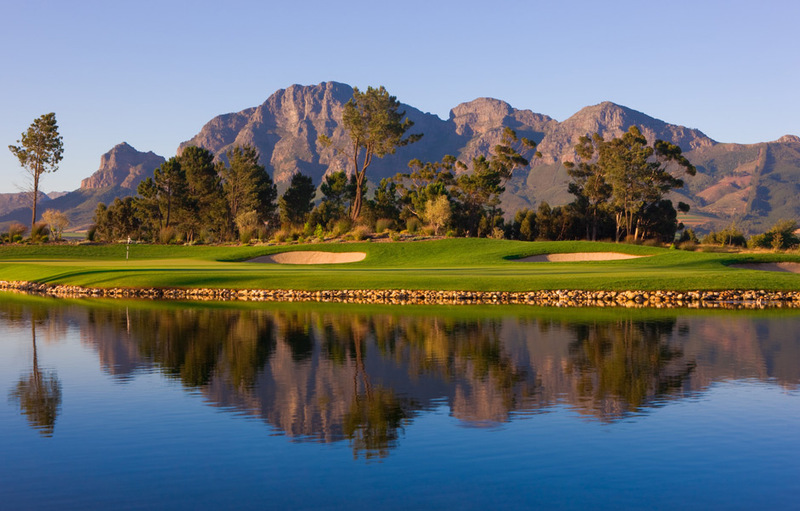 Nicklaus designed Pearl Valley Golf Course is a precious gem hidden between the Simonsberg and Drakenstein Mountains. Today you’ll spend your morning playing a round of golf on 212 hectares of tranquil, unspoiled landscape under brilliant blue South African skies. There was no compromise in layout and design of this magnificent course and it holds true to its promise of an exceptional round of golf. In the afternoon it’s time to relax and enjoy a tour of the Winelands where you will sample a selection of South Africa’s finest award-winning wines. Most of the vineyards will be more than happy to ship selections of their excellent product home for you. Lunch is an optional extra at one of the many fine dining establishments in the area. Today you move back to the Mother City to the elegant Ellerman House where you’ll spend three nights on a bed and breakfast basis with dinner as an optional extra. Ellerman house is a portrait of elegant luxury, culture and privacy. Evoking memories of genteel days gone by, this historic home invites guests to an intimate viewing of South Africa’s rich history through its collection of 20th century South African Masters complemented by the inspiring Ellerman Contemporary Gallery which houses works from many of the country’s foremost contemporary artists. Ellerman House is also a favourite on Condé Nast’s Gold List in the category “Best Hotels for Service”. Cape Town has so much to offer! Soak up the sun on Camps Bay or Clifton Beach. Take a tour of the Peninsula or a trip to Robben Island where the ex-president Nelson Mandela was once exiled. Perhaps you’d like to take a cable car ride up to the top of Table Mountain which was recently voted one of the Seven New Wonders of the World. While in Cape Town contact us for the best restaurant recommendations and reservations.